Can't wait till next January for Pardi-Gras? Visit us in September in New Orleans for our "GULF COAST DAYS" event! This is your destination for "The Ultimate French Quarter Party"
on Martin Luther King birthday weekend. Started in November, 1997, this annual event has been attracting revelers from around the country for a "tropical party" ever since. It was moved from November to January in the third year, and has remained there since. The year 2020 will mark the 23rd annual rendition of Pardi-Gras. 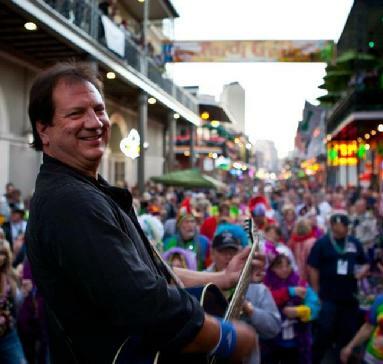 Pardi-Gras caters to people who love original music, and good times. There is a heavy dose of local, regional, and national "Trop-Rock" music involved. (Think Jimmy Buffett, Zac Brown, Kenny Chesney) The event is open to anyone, however, and you don't have to be a member of any formal group to participate in Pardi-Gras. Over the years, Pardi-Gras has evolved into a five day event. The party features plenty of live music, as well as other fun activities unique to the French Quarter. Browsing through pictures of previous years' events will give you a pretty clear picture of what Pardi-Gras is all about. Visit the Pardi-Gras "facebook" page! The Official Mascot and Host of Pardi Gras is the Master Gator! 2010 - "The Pink Flamingos"